Nexgram Land Sdn Bhd, a wholly owned subsidiary of Nexgram Holdings Berhad donates 1,000 rice packets to low income families as part of the company's one week Corporate Social Responsibility(CSR) program for Sepang and Puchong area communities. These communities are located within Nexgram’s two ongoing property development projects worth USD342 million. “This is a corporate social responsibility program initiated by Nexgram Land Sdn Bhd to promote rapport relationship with stakeholders and society. 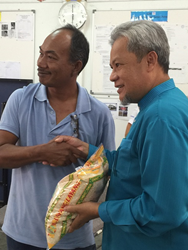 Nexgram Land Sdn Bhd has been spreading the spirit of upcoming Hari Raya Adil Adha by distributing the rice packets to the needy community since this program started on 18 September 2015.” said by Dato’ Sri Wira Ayub Hj. Yaakob, the Chairman of Nexgram Holdings Berhad. The rice distribution will be held at Pangsapuri Kek Wa in Taman Putra Perdana Puchong from 10am to 11am and thereafter in Majilis Perbandaran Sepang, Cyberjaya from 11am to 12pm. The program shall resume from 21 September 2015 to 23 September 2015. This distribution is graced by our Chairman of Nexgram Holdings Berhad Dato’ Sri Wira Ayub Hj. Yaakob, Executive Director Mr Alan How and Managing Director Dato’ Larry Tey Por Yee. The said CSR program represents one of the initiatives taken by the Company to discharge its caring corporate responsibility regardless of race, religion and age. Hari Raya Aidil Adha celebration is a good opportunity for Nexgram to practice and inspire others in Corporate Social Responsibility activities. Nexgram Land Sdn Bhd, a Malaysia-based housing development company, is a wholly-owned subsidiary of Nexgram Holdings Bhd, a company listed in Malaysia. Nexgram Land has entered into an offtake agreement with Angkatan Koperasi Kebangsaan Malaysia Bhd (Angkasa) through its unit MyAngkasa Bina Sdn Bhd where the latter will acquire two property projects to be developed by Nexgram in Cyberjaya and Putrajaya for USD342 million.